John is 57 years old and lives in Benton Harbor. 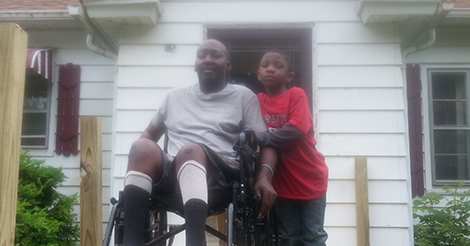 Due to a tumor pushing against his spine, John is paralyzed and uses a wheelchair. On the day our Ramp Up coordinator did a drive-by inspection to evaluate his house for a ramp she saw John being carried over his brother’s shoulder down some crumbling cement stairs. This was the only way John could leave the house and had only done so eight times in the past year to get to his chemotherapy appointments. John said he would lay awake at night worrying that he couldn’t get out of the house in case of a fire or other emergency. John’s four young sons live with him and he said that in addition to the safety issue, having a ramp allows him to do normal everyday things with his family. Now his six year old son can play outside and ride his bike because John is able to be outside watching him.